On a recent road trip to visit some closing Bon-Ton stores, I decided to take a look in the dumpster behind the the Olean Mall store. This video cassette is one of the wonderful treasures I found that day. 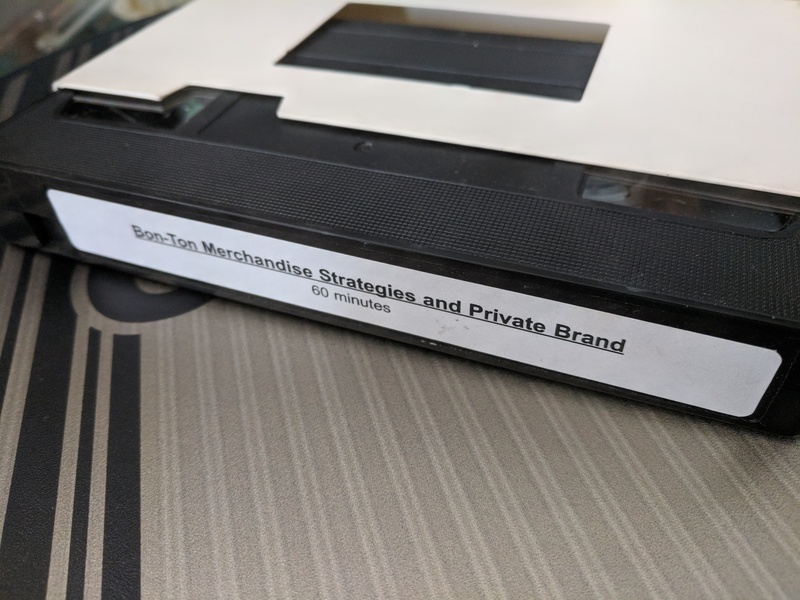 In “Merchandising Strategies” you are introduced to several of the Bon-Ton’s “Core Merchandising Strategies” such as gifts, impulse items, and differentiation of product to set the Bon-Ton apart from other similar stores. You will also be introduced to the product development team who give you a one on one detailed behind the scenes profile for each of the Bon-Ton’s private brands. Without any further ado Mallwalkers presents to you, “Merchandising Strategies”. Enjoy. Still awake after watching “Merchandising Stategies”? Check out this wonderful Rolling Acres Mall video from 2003 to help cleanse your eyes, mind, and sprit.